The global cardiovascular ultrasound system market is projected to reach USD 1.66 Billion by 2021 from USD 1.27 Billion in 2016, at a CAGR of 5.4% from 2016 to 2021. 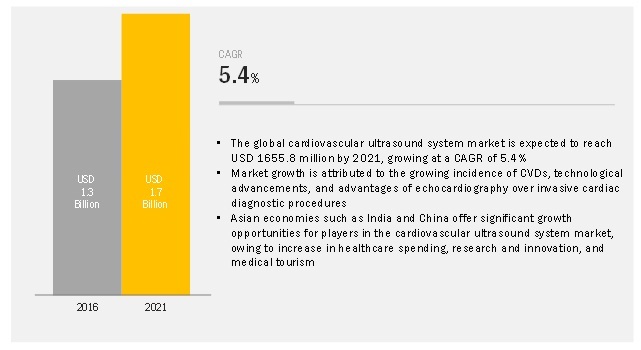 The growth of the cardiovascular ultrasound system market is propelled by increasing incidence of CVDs, technological advancements, and advantages of echocardiography over invasive cardiac diagnostic procedures. However, factors such as insufficient reimbursement scenario and economic impact of adopting new technologies are hindering the growth of the market. Based on test type, the cardiovascular ultrasound system market is categorized into transthoracic echocardiogram, transesophageal echocardiogram, stress echocardiogram, and other echocardiograms. The other echocardiograms include fetal & intracardiac echocardiograms. The stress echocardiogram segment is expected to account for the fastest growth during the forecast period. This growth can be attributed to the advantages of the stress echocardiogram that it can provide data of the cardiac muscles and valves before and after the stress of the heart muscle. The major key players in the cardiovascular ultrasound system market include GE Healthcare (U.S.), Philips Healthcare (The Netherlands), Siemens Healthcare (Germany), Hitachi Medical Corporation (Japan), and Toshiba Medical Systems Corporation (Japan).